On August 4, 2018, Felicia Ann Faust died, and entered eternal rest in Heaven with her Lord. Felicia, born on Nov. 13, 1963, in New York City, was affectionately known as “Feli, “Ti Ti Feli” or as her nephew used to call her “Titi Freddy” (he could not say Feli when he was younger). Felicia was the third of four children born to Ronald James Faust and Leonides Acosta. Felicia grew up in the Bronx until 1976, when her family moved to Mahwah (Bergen County), N.J. Felicia enjoyed growing up in Mahwah, where she was a very popular and admired student at Mahwah High School. Felicia was was known for her one-liners, and was always quick-witted; she was voted class clown in her senior year. As a child, Felicia spent summers on Martha’s Vineyard with her siblings at her Aunt Maggie’s compound. As “structured” as Felicia was, she was also very spontaneous, and in her latter years one day decided that she would try spending her entire summer on Martha’s Vineyard, where she had enjoyed so many of her summers as a child. Felicia fell in love with the Vineyard all over again, and eventually spent most of the year there. It seemed that Felicia was always caring for someone, always looking out for others. It was this desire to help that led Felicia to work as a home health aide with the Visiting Nurses of Cape Cod. To Felicia, this wasn’t just a job. She truly cared about each and every one of her patients, often going beyond what was required of her to help them. They weren’t just clients, many (most) became her friends. 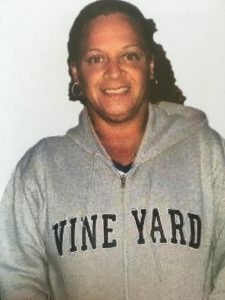 While living on the Vineyard, Felicia reconnected with old friends and made many, many new ones. She enjoyed her coffee before work in the morning, a trip to the beach in the afternoons, and maybe a cocktail at Donovan’s in the evening. If you knew Felicia, you knew that she enjoyed life. She had a laugh that was contagious, a sharp tongue (always with love) and a pure heart. Felicia was very neat and orderly, and also found cleaning houses for friends and loved ones therapeutic. Felicia loved cooking, and cooking delicious foods for others was a passion. Feli loved and cared intensely, and if you were lucky enough to be on the receiving end of this love, you knew that she would protect you in any way she could. She showed her love in so many ways. Taking care of a friend or family member when they were ill, cooking her famous empanadas, drive-by morning visits, always being there. It was a very difficult year for Felicia, but she approached her illness with a positive attitude (and humor) that was who she was. We will miss Feli more than you could ever imagine, but we know in our hearts that she will always be watching over us. Felicia is survived by her mother and father, sisters Rhonda and Pam, her brother Reynaldo, nephews Christopher Burgos and Dylan Faust, niece Reyna Chavez Faust, great-nephew Xavier Burgos, and a host of uncles, cousins, and relatives on the Faust, Alston, and Acosta sides of the family too numerous to mention.